This post is about a marble polishing and restoration job from Sherbourne, Warwickshire. The customer called us because her kitchen/dining floors were dull and dirty. 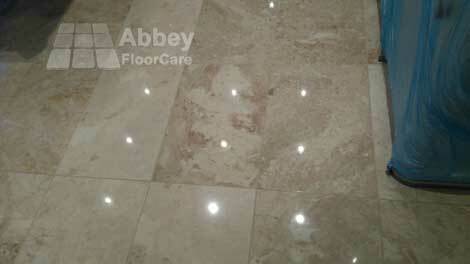 the original deep shine had worn away, leaving the tiles looking dull. The cream grout looked dark and ugly. The dull, grimy finish frustrated the customer. She had three different marble cleaning and polishing chemicals, mops and even a steam mop, but none of them worked. She could not understand why it still looked dirty. I could understand her frustrations with her floor. But the problems was quite simple, ingrained soil and grit. Their dog was bringing sand and soil into the kitchen. He could come and go into the garden through a dog flap in the back door. The soil in his paws was grinding minute scratches on the surface. Soil and grit were also falling off his coat, just waiting to be walked on. 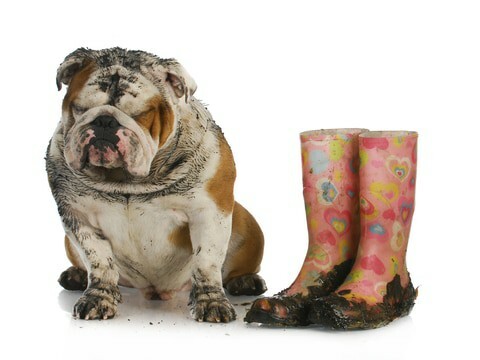 As soon as you walk over soil and grit, it grinds into your floor, making, even more, scratches. 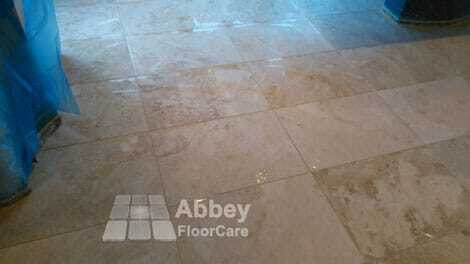 Over time the scratches will ruin the shine, trap dirt and made the tiles difficult to clean. The soil had created these problems. The shine had gone, leaving it looking dull. I explained that there was no problem cleaning, polishing and sealing, to give a beautiful shiny floor. But, to keep a shine, they would need to change the way they cared for their floor. The first thing they need to do is dry sweep more often. Where there are pets, I recommend dry sweeping the floor, at least, two times a day. A sweeping mop will do the job in minutes. You can also use a vacuum cleaner, but you will find a dry mop easier and quicker. Important: Marble cleaners are not made to put a shine on marble. Their job is to remove dried in soil and feed the stone without causing damage. They were happy to follow my cleaning recommendations, but they still wanted to give their dog access to the garden. This amount of cleaning is a challenge. My main worry was that if they didn’t keep it up, any investment in restoration would be short-lived. A full restoration of this floor would cost around £50.00 per square metre and would give an impeccable lustrous mirror-like finish. However, with the size of the area and worry that they may not keep up the cleaning schedule, I recommended they consider a lower marble polishing cost. 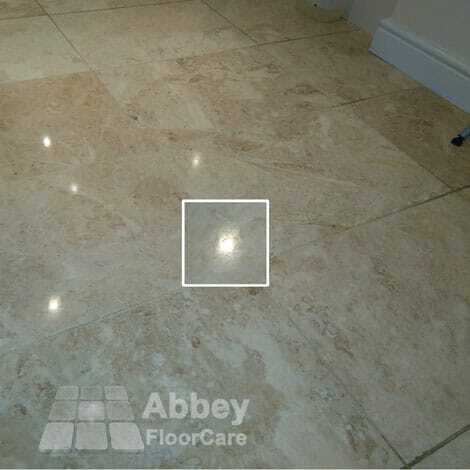 For around £25.00 per square metre, we could clean, lightly hone and polish the marble. The result would be a “softer” shine, but the marble would still be clean, with a high polish and easy to look after. We did a sample area to show the finish I was proposing. 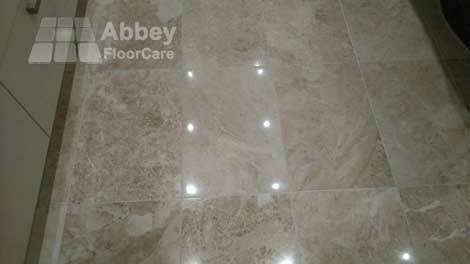 As you can see, the marble and grout in the centre of the sample area are clean and there is a high shine. It isn’t crystal clear, but it is a significant improvement. Our customer was really happy with the sample and the lower cost. We started by protecting the walls, kitchen cupboards, from splashes. This work took nearly 2 hours, but it is essential. 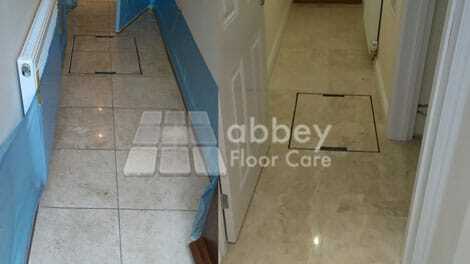 Uneven tiles will cause splashes, and strong cleaning chemicals can damage furnishings and paintwork. Next we used honing tools starting at 100 grit through to 800 grit. This stage removes medium and light scratches and gives a lovely smooth finish. The image below shows the smooth finish. The “shiny” tile border is called, “picture framing” and caused by uneven tiles. The honing process will remove them. Now we needed to clean the grout. We used a rotating scrubbing machine and 800 grit honing powder. This work is just like brushing your teeth with toothpaste. 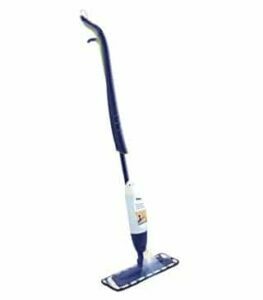 The brush rolls the honing powder into the grout lines to release ingrained soil without damaging the grout. We then used our pressurised hot water clean and capture equipment to remove the slurry, cleaning out the grout. The floor is now clean with a smooth sheen finish. 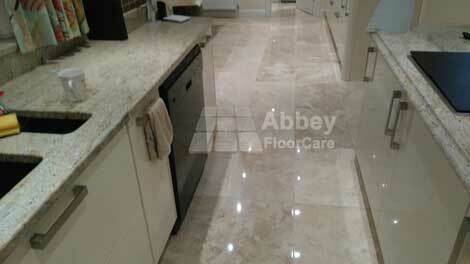 The last stage in polishing a marble floor uses a marble polishing compound that contains fine abrasives and chemicals that react with the marble to give a “wet look” shine. 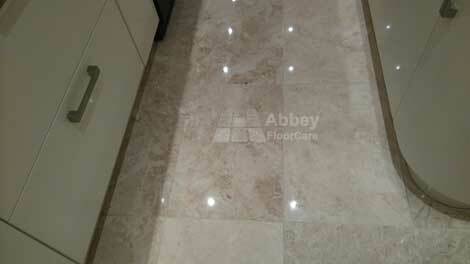 The final part of our marble polishing kit is the high-quality impregnating sealer. The sealer protects the tiles and grout lines from staining and makes them easier to clean. We explained that the chemistry of impregnating sealers meant that they can not stop acid spills etching marble. So it is important to take care when using vinegar, lemon juice, colas, etc., as they all contain strong acids. Are You Looking For Marble Polishing? 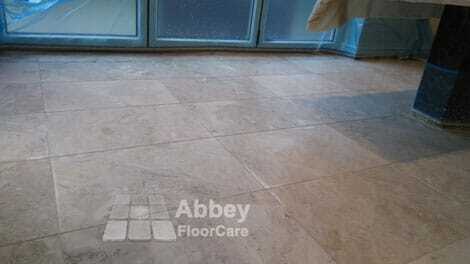 We restore floors in Warwickshire, The West Midlands and throughout the UK. If you have a marble floor that needs polishing, please call 0800 695 0810 for a free marble polishing quotation, or click here to contact us by email. 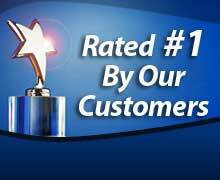 My enjoyment comes from the delight on my customer's faces when they enjoy their beautiful floors. My desire to do a fantastic job is mirrored by a desire to get paid on time. 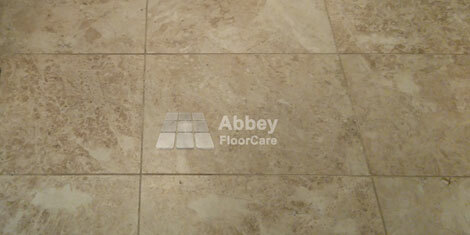 If you're looking for help and advice about cleaning your stone floor I am more than happy to help you. Whether it is spending an hour on the phone talking about the different options you have, or sending you one of our information guides I'm sure I can help you. 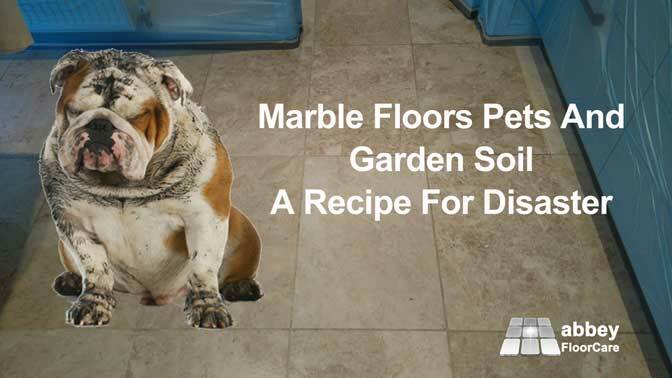 Are Your Marble Tiles Properly Sealed? What's Involved In Honing Marble Tiles?